A two-footed movement in which the toe picks of one foot are inserted into the ice by a skater as a central pivoting point while the other foot travels in a circular pattern around the pivot point. A rotational movement in which the skater moves from forward to backward or backward to forward using one foot and on an edge and axis (e.g. Three-turn, Bracket). In a two-foot turn the rotational movement from forward to backward or backward to forward is from one foot to the other foot (e.g. Mohawk, Choctaw). 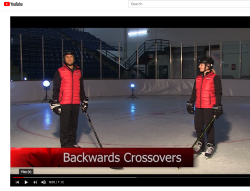 CanPowerSkate is a Skate Canada program that has been designed to enhance the skating skills needed for both hockey and ringette players in the Learn to Train stage of development. Below you will find everything you need to deliver this program at your club or skating school. Please note, this Toolkit is in draft form. Once finalized, it will be available in both printable and downloadable formats. 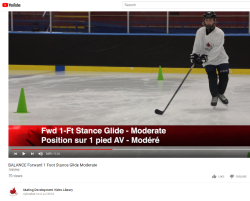 The CanPowerSkate Standard video playlist can be found on our YouTube Skating Development Video Library. 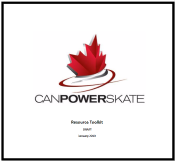 The playlist includes examples of every skill in the CanPowerSkate program performed to the identified standard. This resource provides guidance and strategies to either modify a current session or construct a new session based on the participant's interests and abilities. Canada Skates is a video series featuring a variety of topics related to the quality delivery of our programs. Canada Skates featuring CanPowerSkate will give highlights, tips and strategies to coaches, program assistants and clubs or skating schools on how to maximize their program delivery. These videos may be shared through social media, websites or email. For purchase through our physical product store in the Membership Site (link below). Once accessed, select the CanPowerSkate program from the drop-down menu. 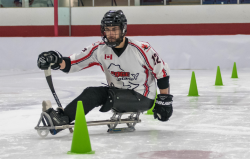 To further support the quality development of this program, visit our eLearning site to explore workshops, seminars and modules on CanPowerSkate. Click on the course title below to go directly to that course. Below is the list of requirements and standards by which clubs and skating schools must abide when offering the CanSkate program. The Advanced Delivery Standards are optional. Ideally sessions should not exceed 30 skaters. Clubs or Skating Schools who wish to offer programs with more than 30 skaters must receive section permission. Movement Minimum 90% movement during the entire session. Greater than 90% movement throughout the session. Note: skaters receiving 1 on 1 individual attention do not affect movement percentage, if the rest of the group is moving. Teaching Aids Use of teaching aids at each station (minimum of marker/signs and pylons) Use of a variety of teaching aids that engages the skaters learning and interest. Assign a Program Assistant to each group for supervision and assistance. Use additional Program Assistants as required to offer an effective and efficient program. Program Assistant Training Ensure Program Assistants are trained before assisting on the ice with a minimum of one training. Offer multiple training sessions throughout the season to engage, support and monitor development of the program assistants. Include forward and backward skating in both directions. Evidence of increased heart rate in participants. Use of circuits designed to fill 1/3 of ice, maximizing ice coverage or adapting the circuits to fill ½ or the full ice surface. Development Time Use of Development Time to enhance skills and speed. Coach ensures that each skater in the lesson receives one on one attention on the circuit during the lesson time. Individual challenges based on their level of development within their lesson and circuit, without stopping the entire group. Offer a minimum of 1 parent information or interaction session per season. Use official Skate Canada badges and award them at the end of each season.